Our precious little girl turned two over the August Bank Holiday weekend. Time seems to be going so fast! It also marked one year since I’d made my first decorated cake for her first birthday. I had been thinking about what to do for her birthday cake for a while. She loves Peppa Pig at the moment, so it seemed as good idea to do something that we could look back on as a reminder of what she liked at this age. The cake I designed was not the cake I ended up making. I was really sick the week leading up to her birthday (the post here explains why) so I couldn’t start the cake till Thursday and her party was on Saturday. At one point in the week my husband even suggested that I didn’t do a cake at all as I was so tired and sick, but I couldn’t bear the thought of her not having a cake when she was the reason I started cake decorating in the first place! I knew I didn’t have time to do all the details for the cake I’d designed, so I changed the design to a more simple pink and white theme to fit in with the bunting I’d bought for the party in different shades of pink, and the balloons which were also different shades of pink. 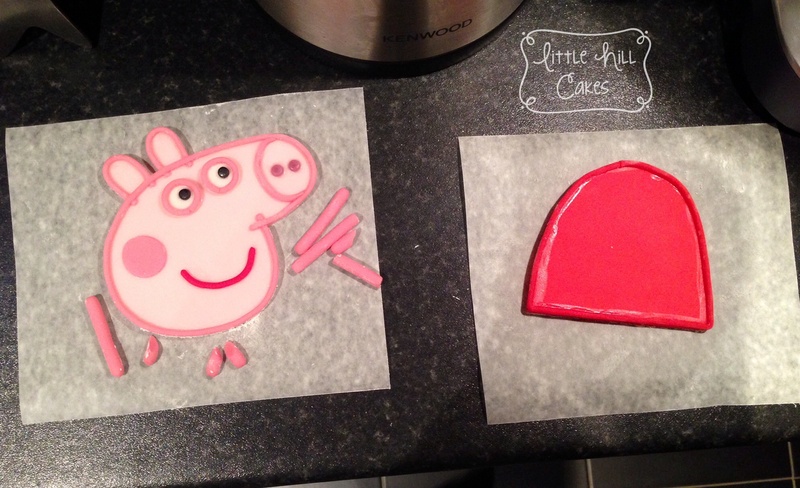 I’ve seen lots of 3D toys and cakes of Peppa Pig, but for me personally, I don’t like seeing Peppa in 3D. In the TV episodes and books, you only ever see the characters in 2D and side-on, so I think the characters just don’t look right when they’re done in 3D as the eyes end up one on each side and so don’t look like the proper characters. 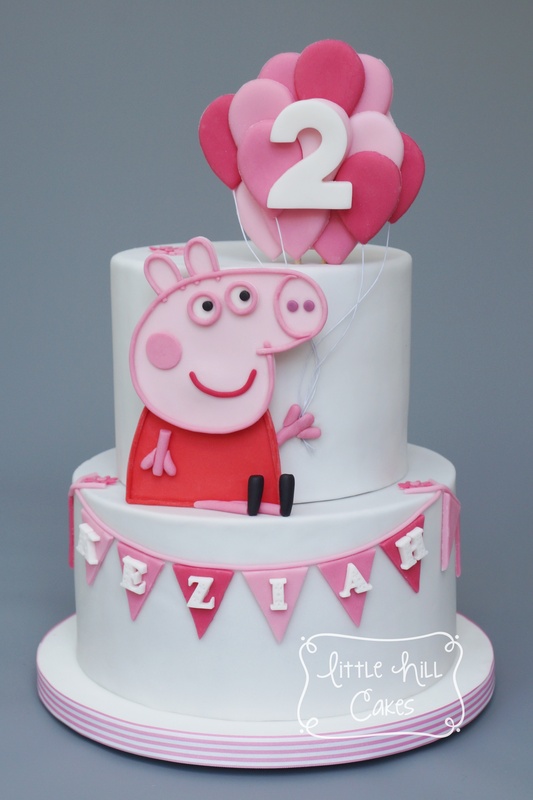 I have seen some amazing pictures of 3D Peppa Pig cakes on Pinterest and Facebook, but it’s just my personal preference that I think the characters look more like the ‘real’ thing in 2D. 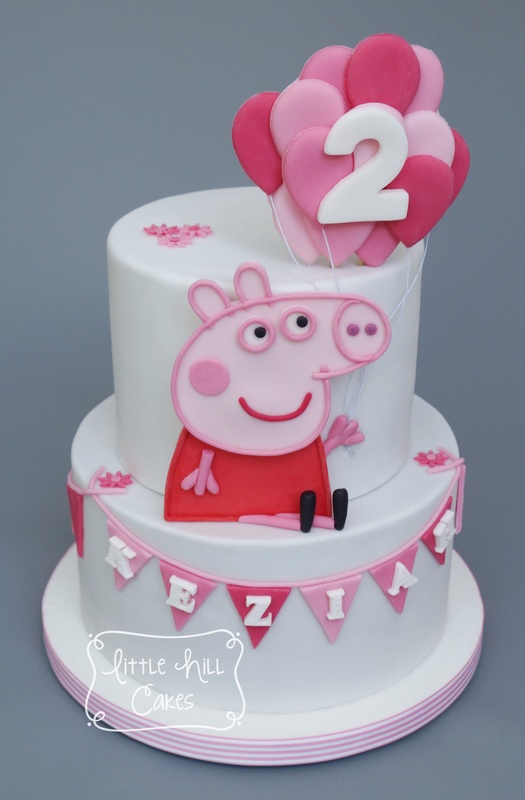 So my design was to have a 2D Peppa Pig stood on the bottom tier holding a bunch of balloons that would sit on the top of the cake. Our daughter has a book of Peppa Pig with various size pictures of Peppa in it, so I found one that was a size I liked and traced the outline so I could cut a template out of paper. I then used the template to cut out the head section out of pink and the body out of red. I piped lengths of a darker pink using an extruder to use as the outline for the face, ears, eyes and snout, and then piped thicker parts to make the arms and legs out of. For the balloons I used a petal cutter. I rolled the fondant quite thick and laid cling film over it so that when I cut the balloons the cutter pulled the cling film tight and rounded the edges. I used a triangle cutter for the bunting and piped a thinner ‘rope’ of fondant using an extruder. I used a Martha Stewart Silicone Alphabet mould to make the letters for the bunting. When it came to assembling the cake, Peppa was a bit too big to stand up on the bottom tier, so I sat her down instead. I used cake wires for the strings of the balloon. These were a nightmare to fix on! I attached them behind the hand but they kept popping out and broke the fingers, so I had to repair those. I think using butchers/cooking string might have been a better idea! I tried a new recipe for the top tier of the cake. I love Summer Stone’s Cake Paper Party blog and tried her American Mud Cake recipe when I made the Sun, Sea, Sand and Sky cake, but I never got to try any as they cut the other tier while I was there. So this was the first time I’d got to try it, and it was so delicious! I’d used another mud cake recipe previously for the Shoe Box and High Heel cake I made, but the other recipe was a lot denser (almost brownie like) and although I still love that recipe, I like the new one even more! I would go as far as to say it’s probably my favourite chocolate cake recipe ever!! This cake is so cute! 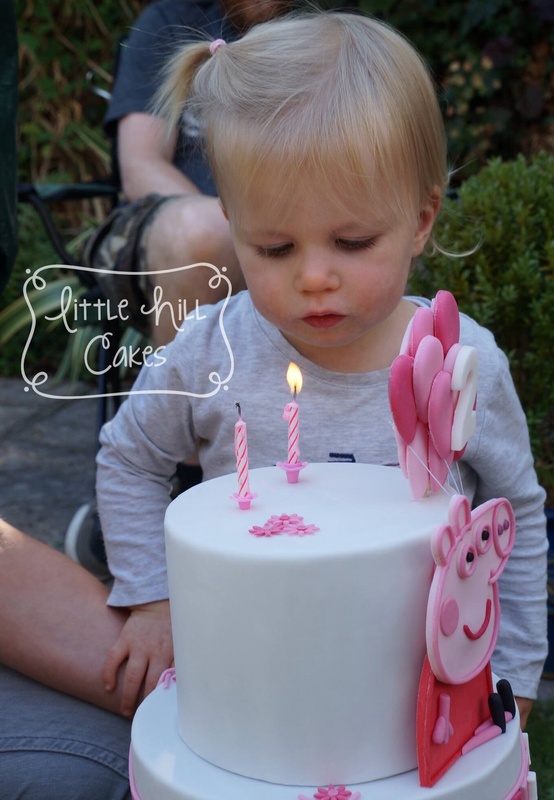 I made my son a Peppa pig cake for his 3rd birthday, 2 years ago. Now my 2 year old daughter is obsessed with Peppa. I was looking for a more girly design and this is perfect! Thanks for the inspiration! I absolutely love this cake! Would you share how you made the balloon cluster? To make the balloon cluster I cut out a thick circle of fondant, laid two wooden food-safe skewers on it vertically (and parallel to each other) and pushed them into it (to attach the cluster into the cake once it was finished), and then left it to dry a couple of days so it was firm. I then made the balloons using a petal cutter but laid cling film (plastic/saran wrap) on top of the fondant so that when you push the cutter down the cling film is pulled tight and rounds the edges of the shape. I left the balloons to dry for a while and then attached them to the circle with a bit of water (so that none of the circle or skewers were left showing) and did the same with the number 2. Oh dear 😟. I would cut out a large circle of fondant (with tylose added) and leave it to dry for a bit (you could also attach a couple of wooden kebab skewers if you have them to enable you to insert them into the cake when you add the balloons on), then attach the balloons onto the circle (covering the whole of it so it’s not visible) so it has a firm base, and hopefully they won’t break off then. If you are using water as ‘glue’, then leave it for 30 seconds to get tacky before sticking them on. If I were making this cake again if probably use royal icing as ‘glue’ as I used that on the last two cakes I made and it worked really well at holding things firmly in place. Hope that helps? That does sound strange that they are going soft, I’m not sure why that would happen. Hope you manage to resolve it ok.
Hi I was wondering how much you would charge to make my little girl one of these cakes. Hi, this is a really cute birthday cake. My niece loves Peppa Pig, so I’m looking for some ideas. I was wondering what sized cake pans you used?? Thanks Amy! 🙂 The bottom tier was 8″ and the top tier was 6″. Hope that helps.